Deciding where to buy a vacation home or retirement home in NW Wisconsin? What you can learn from our dashes back to Minneapolis/St Paul, MN. My husband and I moved to Northwest Wisconsin 16 years ago, when we were nowhere near ready to retire (we’re still not). Our work has required both of us to make occasional trips back to the Twin Cities for meetings. We also get down to the Cities now and then to visit relatives. Even if your situation is different, there’s a lot you can learn from our dashes back to the city. Elsewhere on my website, I’ve shared many great reasons to consider Northwest Wisconsin. We have lots of great lakes, streams, trails, public land, and more. 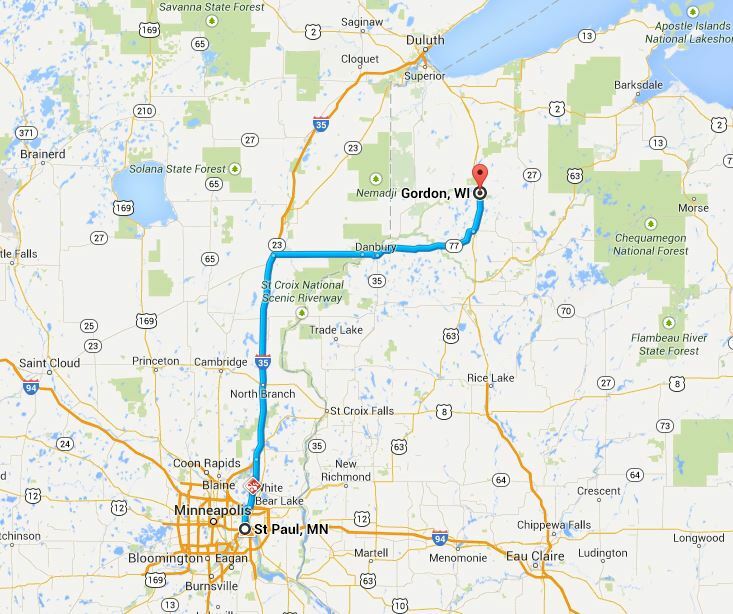 To get here from Minneapolis/St Paul, we can head north on I-35, hang a right at Hinckley, and be in Minong before we know it. From there, we’re almost home. From the Twin Cities, it’s an easy 2.5 hours. So if you’re looking for a vacation home or retirement home, then what do these occasional dashes to the city have to do with you? Everything. The same thresholds will still be there. But they’ll instead determine how much enjoyment you get from your new cabin or lake home. If your drive time is beyond a certain threshold, then there will probably be fewer weekends when you get away to your weekend getaway. Planning to move up here for good when you retire? Welcome to the neighborhood! If places like Minong, Wascott, and Gordon aren’t yet on your radar, they should be. Same with the Minong Flowage, St Croix Flowage, Whitefish Lake, and many other small to large lakes. Barnes and Solon Springs is just a bit farther and offer Upper St Croix Lake, and the Eau Claire chain of lakes. Under the lakes and rivers tab above, you can find out more about these lakes. Please take a moment to explore my website and find out more about the lakes and rivers of Northwest Wisconsin. Then drop me an email or give me a call at 218-590-6634. I’d be glad to show you what’s available in our neighborhood.